Helps loosen phlegm (mucus) and thin bronchial secretions to rid the bronchial passageways of bothersome mucus and make coughs more productive. for children under 12 years of age. persistent or chronic cough such as occurs with smoking, asthma, chronic bronchitis, or emphysema. cough accompanied by too much phlegm (mucus). cough lasts more than 7 days, comes back, or occurs with fever, rash, or persistent headache. These could be signs of a serious illness. If pregnant or breast-feeding: ask a health professional before use. adults and children 12 years and older: 1 TABLET every 12 HOURS. Do not exceed 2 TABLETS in 24 HOURS. Tamper evident: do not use if carton is open or if seal on bottle printed “SEALED for YOUR PROTECTION” is broken or missing. Store between 20° and 25°C (68° and 77°F). Carbomer 934P, NF; FD&C blue #1 aluminum lake; hypromellose, USP; magnesium stearate, NF; microcrystalline cellulose, NF; sodium starch glycolate, NF. 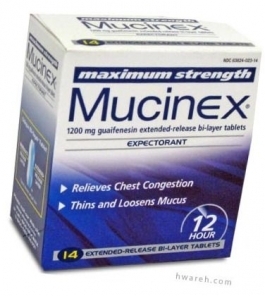 For help with this product, please call 1-866-MUCINEX (1-866-682-4639) or visit their Web site: www.mucinex.com.